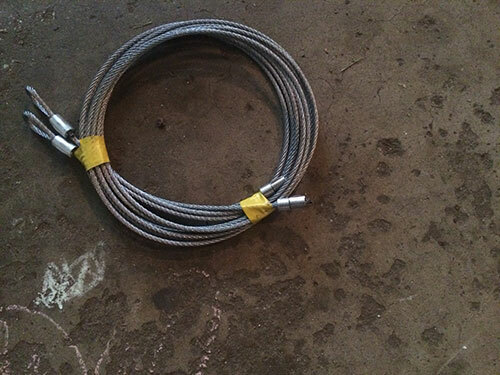 Cables are essential parts of the garage door spring system. They're actually wires, which are wrapped around cable drums in torsion spring systems and pass through pulleys in extension spring systems. It is easy to understand when cables are broken since they are either hanging in the air or dropped on the floor. In either case, the garage door won't move without them. They actually hold the weight of the garage door and are wrapping around the drum as the torsion spring unwinds. This way, the overhead door opens up. How to Fix A Broken Cable? There is no way to fix broken cables. It's vital to have them replaced immediately. It’s also important to remain away from the garage door especially if it's stuck half open. Cables don't break together. So, the door might be sagging to the side. It's best to avoid attempting closing the door if it's open or interfere in any way. Cables are not replaced easily and need expert professionals. They usually break due to natural wear or due to great force put by a very heavy door. It's best to have them replaced when they start fraying to keep them from snapping.